WASHINGTON — Congress has become skilled at distancing itself from President Donald Trump, but some are urging elected officials to go beyond tweets and press releases in response to the president's comments about last weekend's violence in Virginia when they return from recess in September. Members of both parties have condemned Trump’s insistence that "both sides" bear some responsibility for the clashes at the Charlottesville, Va. rally and his defense of "very fine people" who joined a torch-wielding group of white supremacists that marched on the University of Virginia chanting "Jews will not replace us" and Nazi slogans. But some some politicians are also pushing a menu of legislative options that they argue could help send a message to hate groups, encourage tougher executive action, and more clearly repudiate Trump's position. "I really believe if we are a government made up of three co-equal branches of government, I think it’s time for the Congress to step up and into the gap, so to speak," Rep. James Clyburn, D-S.C. said in an interview with MSNBC on Wednesday. In the most explosive example, a group of Democrats unveiled legislation to censure President Donald Trump for failing to adequately condemn white supremacist groups and for blaming “both sides” for violence at the rally. The bill, by Reps. Jerrold Nadler, D-N.Y., Bonnie Watson Coleman, D-N.J., and Pramila Jayapal, D-Wash., would also call on Trump to fire aides Steve Bannon, who boasted while running Breitbart News that the site was “the platform for the alt right,” and Sebastian Gorka, a former Breitbart editor who mocked concerns about white supremacist terror just days before the rally. Groups like the Anti-Defamation League have also raised concerns about Bannon and Gorka, who have denied any ties to white nationalism or extremism. “Congress needs to send a clear message that white supremacy and Nazi sympathy is not the official position of the United States government,” Nadler said on Twitter. Outside activists have called for censure as well. The liberal activist group MoveOn.org have also circulated a petition in support of the idea and Jesse Ferguson, a former campaign aide to Hillary Clinton, has promoted the idea on Twitter. “I’m a regular citizen who can tweet and Facebook that I don’t like what he said, but my elected officials need to be held to a higher bar,” Ferguson told NBC News. Their efforts got a boost on Wednesday from USA Today, which published an editorial calling for censure as "a forceful way of rebuking the White House and condemning the vile views of a bigoted fringe." Reps. Bennie Thompson, D-Miss. and Cedric Richmond, D-La. each repeated calls to remove Confederate symbols from the Capitol Building, which displays statues to Jefferson Davis and other Confederate figures. “These images symbolize a time of racial discrimination and segregation that continues to haunt this country and many African-Americans who still to this day face racism and bigotry,” Thompson said in a statement. They were joined on Thursday by Minority Leader Nancy Pelosi, D-Calif. who called on Republicans to back legislation that would move the statues. "If Republicans are serious about rejecting white supremacy, I call upon Speaker Ryan to join Democrats to remove the Confederate statues from the Capitol immediately," Pelosi said in a statement. Senator Cory Booker, D-N.J. also announced on Wednesday he was introducing legislation to remove the Confederate statues. Virginia's two Democratic senators, Mark Warner and Tim Kaine, have both indicated support for his efforts. "I’m talking to him about how we might move forward on that," Warner said in an interview with Virginia radio station WRVA on Thursday. 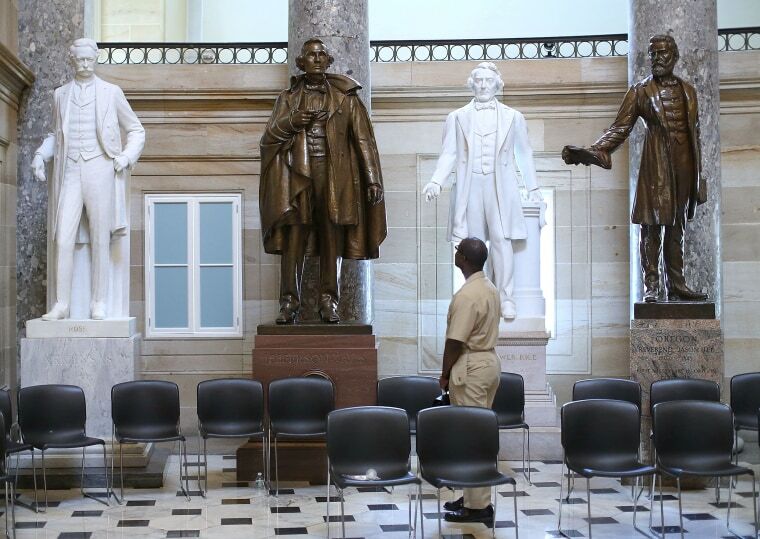 There are currently 12 statues in the Capitol’s Statuary Hall that honor Confederate soldiers and politicians, according to the Washington Post, versus four statues honoring African Americans. The statues were chosen by state governments, each of whom are assigned two slots, making their removal more complicated. “These are decisions for those states to make," a spokesman for Ryan told NBC News on Thursday. But the week's events could spur leaders outside Congress to take action as well. State and local elected officials around the country have redoubled efforts to take down Confederate statues and memorials in the days since the Charlottesville attack. Republican Senators Thad Cochran and Roger Wicker renewed calls this week to remove the Confederate flag imagery from the Mississippi state flag, whose presence in the U.S. Capitol building has also drawn criticism from Thompson. On Tuesday, Democrats on the House Homeland Security Committee called on Chairman Michael McCaul, R-Texas to schedule hearings on domestic terrorism when they come back in September. “Unfortunately it has become clear we cannot count on President Trump for action,” the group of twelve Democrats wrote in a joint letter requesting the hearing. McCaul responded the next day that he would hold a hearing on September 12 to help "find ways to rid our nation of the scourge of white supremacism." The Senate Committee on Homeland Security and Governmental Affairs is also expected to announce a hearing soon, a spokeswoman confirmed to NBC News. The hearings could focus more attention on the White House's response. Experts on hate groups have urged the administration to come up with a clear plan to confront white supremacists, who they say have been energized by Trump's political rise. Attorney General Jeff Sessions has pledged a vigorous response to the Charlottesville attack. While legislation to censure the president is unlikely to attract Republican support, GOP lawmakers in Congress had grown more assertive in their relationship with Trump even before the events of the past days. In recent weeks, Congress overwhelmingly passed legislation codifying sanctions on Russia over objections from Trump. Two Republican Senators have introduced separate bipartisan bills to protect Special Counsel Robert Mueller should Trump try to remove him from his investigation. A raft of Republican senators also defended Attorney General Jeff Sessions and Senate Majority Leader Mitch McConnell from attacks by Trump. Lawmakers in both parties could apply additional pressure on the administration if they believe the White House is slacking. Senator Lindsey Graham, R-S.C. called on the Department of Homeland Security to form a task force on white supremacist violence that reports to Congress and has been strongly critical of Trump’s response so far. “Many Republicans do not agree with and will fight back against the idea that the Party of Lincoln has a welcome mat out for the David Dukes of the world,” Graham said in a statement on Wednesday.